With vRealize Operations Manager 6.0 (a.k.a. vROps), VMware released a version which introduced not only major architectural changes but also many new features. Amongst those (amazing) new features, the concept of symptoms, recommendations and actions were added to the product. The actions available in vRealize Operations Manager allow you to modify the state or configuration of selected objects in vCenter Server from the correct context in vROps user interface. An administrator might need to change the configuration of an object to address a problematic resource issue or to redistribute resources to optimize your infrastructure. 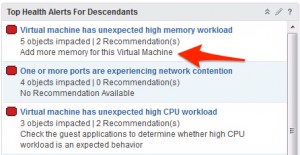 For example, if a VM is experiencing memory stress due to insufficient memory resources or unexpected high memory workload, vROps will trigger an alert for this particular and suggest one or more recommendation with possible associated actions. In the screenshot below, you can see a “Set Memory for VM” button. With the initial release of vRealize Operations Manager, we have only a limited amount of actions available: currently, 9 remediation actions are available out of the box. 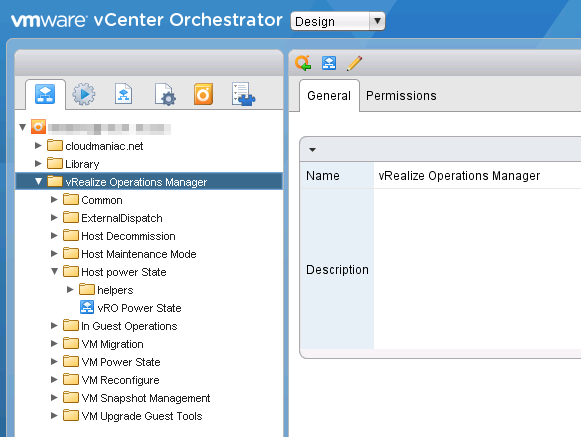 However, you can now integrate new actions with the vRealize Orchestrator Solution and Workflow Package for vRealize Operations Manager which was recently made available. This package enables you to automatically resolve operational issues identified by vRealize Operations Manager using vCenter Orchestrator workflows. The vRO Solution and Workflow Package enables you to execute specific remediation workflows directly from the vROps user interface, to automate a repetitive action, or automatically remediate a problem Alert. 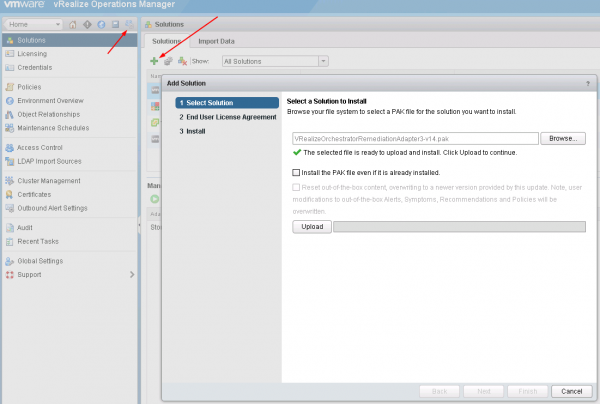 The solution exposes the following Actions within the vRealize Operations Manager user interface. Important: you have to ensure that vRealize Orchestrator links to the same vCenter as vRealize Operations Manager. I don’t think that the installation order have an importance, so let’s start with vROps. You have to import a new Solution and configure an instance. 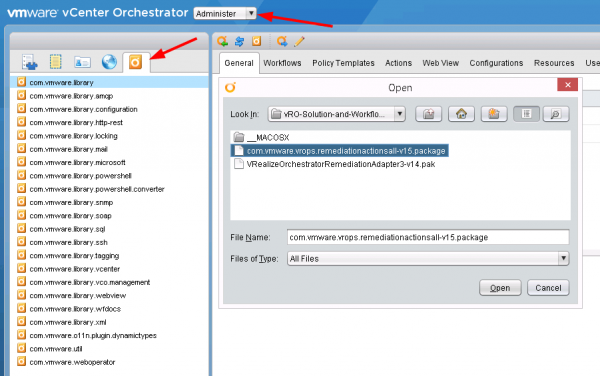 For vRealize Orchestrator, you have to import the package in the Administer view > Packages . Select the downloaded package and follow the process. You can verify that the new workflows are present in your system. That’s it! After that, new actions will appear in vROps and you can start associating them to recommendations. Great post. I was wondering if there are some directions on creating new actions. What I have in mind is vROPS -> vRO -> NetApp WFA -> (Do some really cool NetApp Stuff) workflow. Hi Mike, thank you for your comment ! There might be the possibility to create new actions from one of the future releases, but I don’t know exactly when. Did you tried Pierre’s plugin (at the end of the article), it might do the job for your scenario, no? I sure did. I’m about to give that a try. It actually fits in well with the lab I’m creating for the NetApp version of VMworld in Las Vegas this October. If you have any pull with the vROPS folks – it would be very spiffy if you could tokenize the url in the recommendation. It would be even better if VM tags could be part of the token. That way I can seed other information in the VM Tag. Great stuff. We are well on our way to a software defined data center. Say Hi to Eric! So this install went just fine but how do I go from here? 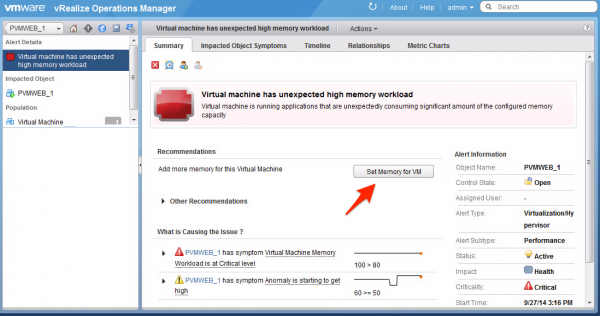 I’d like for vCO to start an additional VM when an alert for particular VM is raised in vROPS. However I am having a hard time finding any info on how to do this.How can I get the alert to trigger the new action and kick off workflow? Thanks Romain, I basically got up to where your post ends. I can see the new actions. I will upgrade to 6.2 and see what it can do for me. thanks for your post, it is much helpful. Please let me know if its possible to invoke custom workflows from vROps or the only way would be edit the ones provided by default and customize them as needed.